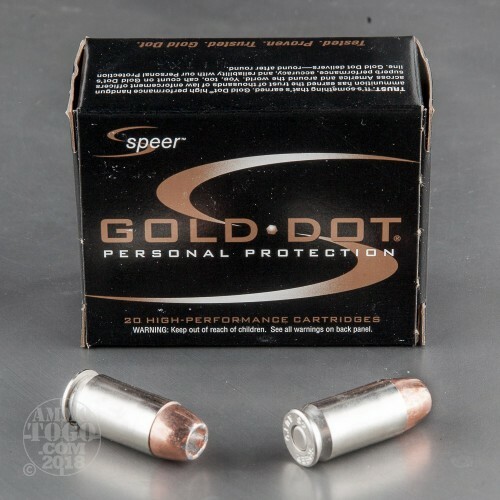 Speer’s Gold Dot ammunition is meant to deliver in any situation, whether that would be for home or personal defense, and it certainly does. 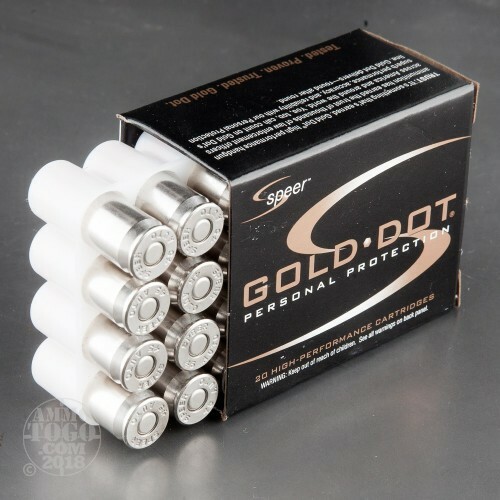 Gold Dot is the very first line of handgun ammo to feature a genuine bonded core bullet. 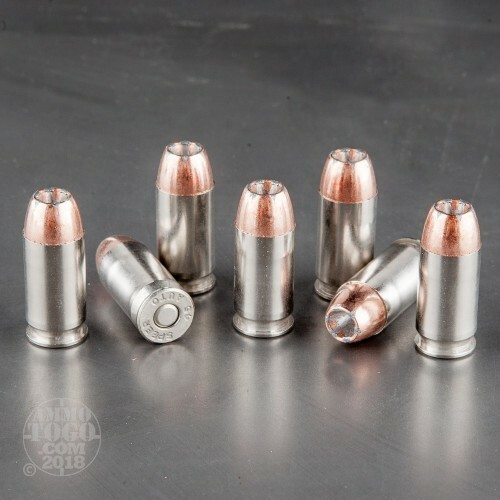 Because this 45 ACP round’s 185 grain bullet’s jacket has been electrochemically fused to its alloyed lead core, it is not only exceptionally concentric for accurate shooting, but furthermore nearly incapable of separation during penetration. Couple that with the dependable fashion in which a Gold Dot is programmed to expand within a soft target, and you’ve got a bullet you can always rely upon in an otherwise unreliable world. This round’s other components are worthy of supporting so impressive a bullet’s performance. Its brass casing is nickel plated, so it functions smoothly, staves off corrosion, and is easily spotted during a spontaneous chamber check in nearly all lighting conditions. CCI’s best non-corrosive primer stands by to ignite this round’s select propellant, which delivers the ideal muzzle velocity and corresponding chamber pressure. As you hunt for the best self-defense 45 ACP (Auto) ammo, we thought you might enjoy seeing the results of some testing we recently conducted with calibrated Clear Ballistics gelatin. We shot five of these Speer rounds through a four-layer cloth barrier using a Ruger SR45. The results are detailed in the video you see above as well as the photographs. Through the charts, you should get a great idea how this Speer ammo stacked up relative to other 45 ACP (Auto) ammo products available to American shooters. 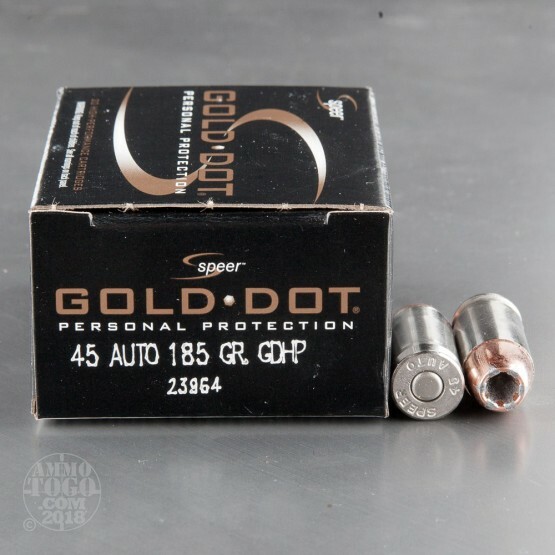 How do the results for this Speer 45 ACP (Auto) compare to other 45 ACP? 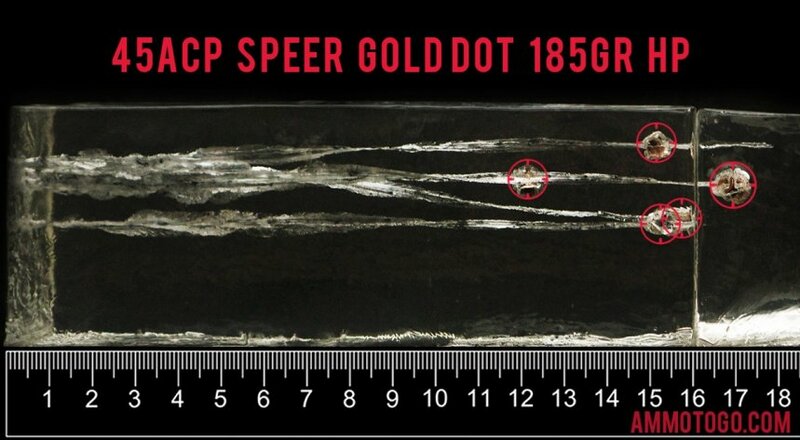 Expansion Diameter Compared to All 45 ACP (Auto) Ammo Tested MIN 0.45" MEDIAN 0.64" THIS AMMO 0.69" U.S. dime MAX 1.04"
Penetration Depth Compared to 45 ACP (Auto) Tested 0" 10" 20" 30" MIN 8.3" MEDIAN 16.7" THIS AMMO 15.4" MAX 32"